Who’s idea was it for me to go on a Caribbean cruise today? It seemed like a good idea at the time, but after the chaos of the last few weeks, which I won’t bore you with, it really did seem like a good idea at the time. I drove up to Manchester airport yesterday afternoon and spent a comfortable, but sleepless night at the Crowne Plaza. Sleepless for no other reason that my brain wouldn’t switch off, after spending most of the night jiggling stuff between case and hand luggage, turning stuff out and dragging the cases back and forth to reception to weigh the case. I had given up on my hand held digital scales. Every time I weighed the big case at home it was less than 23kg, every time Mr C did it, it was over. So I weighed it again when I checked in at reception and it was 24kg! Something had to go. I did manage to fall asleep about an hour before my 5.00am wakeup call though. I arrived at Term 2 check in just as the check in desks were opening. I was most put out when I realised nobody guided me to the Premium check in after paying for the privilege. I couldn’t have had a nicer girl check me in though. She weighed the big case, and tagged it, so fast that I have no idea how much it officially weighed. I bet I could have packed more! She didn’t even look at my hand luggage, just asked me if I had any. Upstairs to go through security and the queue was huge. I stood in line wondering if my poorly feet could manage and then I looked down at my boarding card. ‘Priority Boarding’ Amen, yes, I was out of that queue faster than a whippet out of its trap, and diverted myself into the fast lane with no waiting or standing around. Next stop was the Exec lounge. Nice hot bacon sandwich and a latte to start me off, oh and a cranberry juice and then a little rum or two to warm me up. I set off for gate 202 as soon as it went live on the board as I’m not as fast on my feet as I used to be. 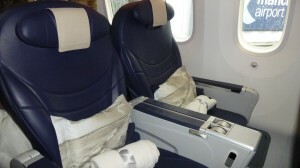 No sooner was I there and seated than Premium Club passengers were invited to board the aircraft. I was in seat 2A and thankfully nobody was in 2B. Probably just as well because climbing in and out of the seat getting past the central console was not easy. The seats were very comfy, really wide and more than enough leg room. Seats in front of me seemed to be very far in front. I certainly wouldn’t pay for extra leg room seating to be on row one. Windows were bigger and had buttons than dimmed them rather than screens over them, but what really did it for me was the leg rest, anything that made my feet more comfy was well worth the £249 upgrade fee. TVs were stowed in the arm and table in the other arm of the seat. Loads of films and programmes to watch as well as the usual games and info channels. We had fizz before takeoff, we were late taking off but arrived quite a bit earlier. I think our flying time was 7hrs 20 mins which is loads faster than I have flown Barbados before. We had a snack of a bag of crisps shortly after takeoff, then drinks, hot, or drinks from the bar. Lunch was excellent, four courses with a choice from the menu for main. I chose the poached Salmon with pepper crust, which was delicious – by far the best airplane meal I have ever had. The deserts were to die fo . There was wine with the meal, Baileys or Brandy after, and I lost count of the amount of times the drink trolley came around. I think I may have had a tiny snooze at some point wrapped up in my blanket and with my nice soft pillow. 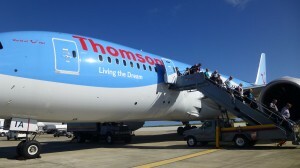 Did you know that Thomsons is the first UK operator to get the Dreamliner, and I think they have six. We flew on “Living the Dream”. Dreamliners fly at mach speed 0.85 at approx 640mph! If I was flying long haul again and it was a Dreamliner I would certainly upgrade as it was a fab flight experience. 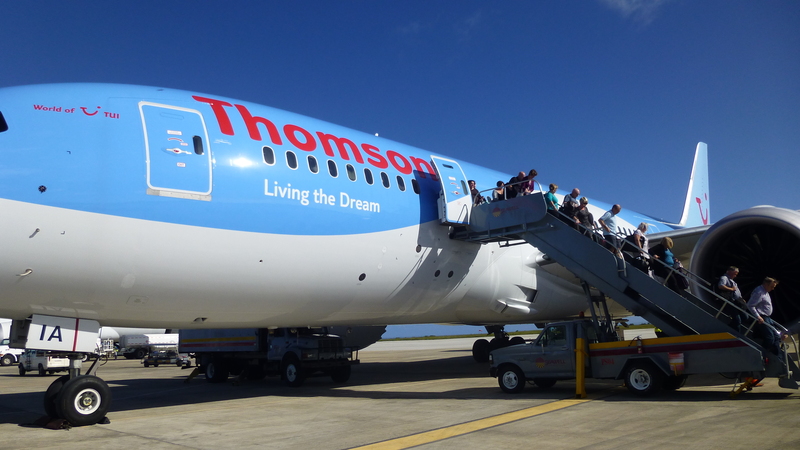 When we landed in Barbados it was so hot. It’s hard to believe that that it can be this hot when it’s so cold at home. The transfer was reasonably quick as we were a bit early for the Barbados rush hour traffic. Check in was extremely quick, well it was for me, but what delayed us was the queue through security. 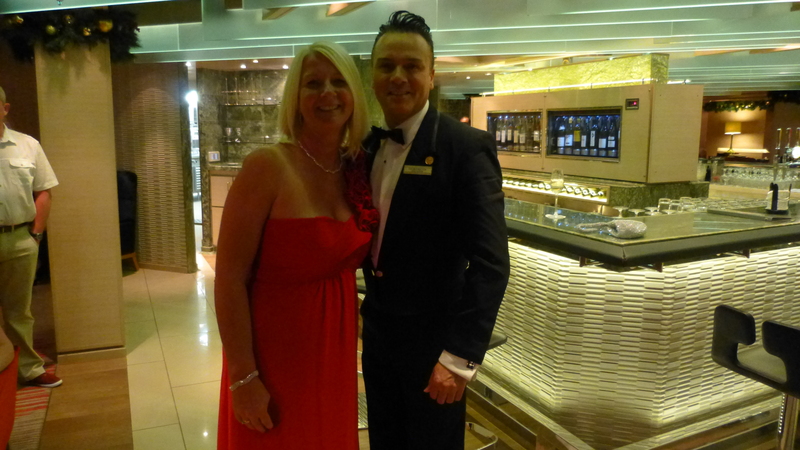 My favourite Passenger service Manager looked a little taken a back to see me walk up the gangway so soon after my last Azura cruise. I saw the look of panic rush across his face lol. He tried to walk with me through the gauntlet of ‘would you like to book Sindhu, would you like to look at the spa menu, have you thought about visiting the gym’ in the trap that they build in the Atrium, its rather amusing that I managed to keep my head down and avoid them all but he got trapped and I lost him, which I was reprimanded for later lol. 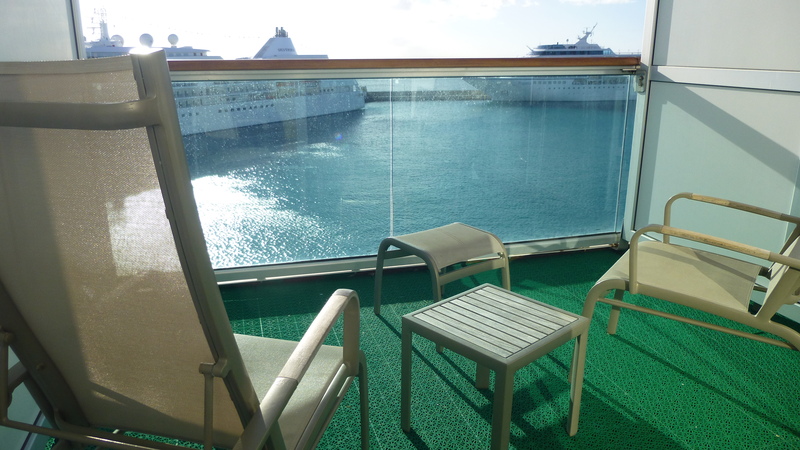 The sunshine was blasting onto my C deck starboard side balcony. Silver Whisper and Oceania Regatta were opposite glistening in the sun. It all looked pretty perfect, but all seemed very normal. Do I do this too often? After unpacking the hand luggage I decided to go in search of free wifi in the terminal. My feet were suffering now and I could hardly walk on them, but an hour on a bench with my feet up, in the terminal helped calm them down. By the time I got back outside it was dark, which threw me a bit. Back onboard I wandered upto Breakers bar and again sat with my feet up having a Caribbean Cruise Cocktail, for no other reason than its the law! My case had arrived in the cabin so that was soon unpacked and everything put away. Oh its a joy having a whole cabin to yourself. Hangers for everything, and stuff spread across all the drawers and shelves with nothing crammed in, sheer bliss! After a quick shower I took the lift down to Glass House. So what to do about dinner? Well I needed to eat, or did I? 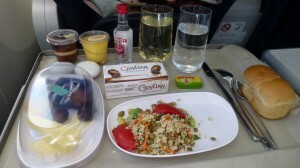 I still feel full from my Dreamliner flight experience, but then if I don’t eat I might wake in the night hungry. I could have quite happily sat on the balcony with a room service sandwich, but felt the need to be sociable. It was open sitting in Oriental restaurant. I was seated at a table with a group of six friends travelling together from Newcastle. They were very quick to learn my name but I wasn’t so quick to learn theirs. I couldn’t have been sat at a nicer table though, and we all had a good natter and a giggle. The menu – I don’t even know why I bothered to look at it. Melon, minestrone soup and roast port or rolled fillet of plaice. 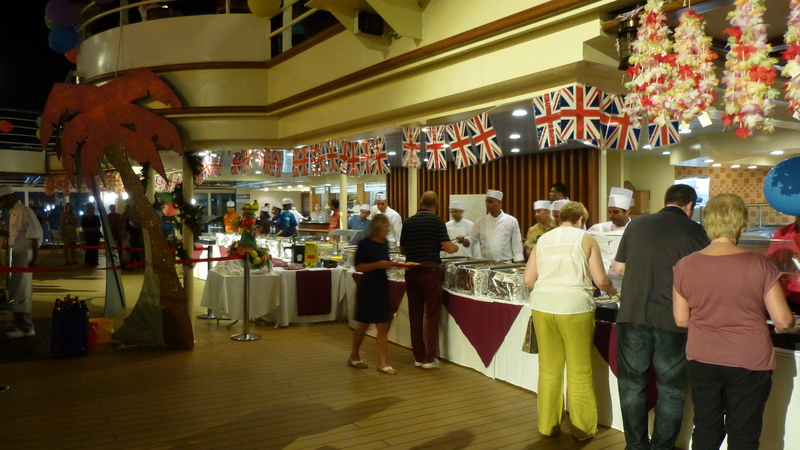 The waiters were lovely and I thought they were excited at the thought of a night in Barbados, but it was better than that as they were on their way home tomorrow. After dinner I had a very gentle stroll around, checking what was going on in the various bars, before retiring at 11.00pm which is really 3.00am. I have to say that I am really surprised that I do not feel as tired as I should do. Maybe that Dreamliners claim of causing less jet lag, due to better air quality and more oxygen etc, is true. I don’t usually feel like this. Usually I step off the plane in Barbados feeling tired, scruffy, grubby etc, but not today. Tiredness hasn’t really hit me. Two sleeping tablets for me tonight I think just to be sure my eyes close! So sleeping was good. Two sleeping tablets did the trick and I had a good sleep until just before 6.00am which is normal for me, considering that was 10.am UK time it was a lay in lol. I decided it would be a good idea to get up and go to the terminal building to make use of the free wifi whilst there was nobody else around. There were actually a couple of crew members sat around, but certainly nothing like yesterday afternoon. Internet was working much better with less people around so emails were checked, and a conversation with Mr C courtesy of Skype. One has to go on a heck of a trek to get back onboard. You pass the gangway, go around some fenced off area and through the back of the shed to come out the other end and retrace your path back to the gangway you pass in the first place, not good with poorly feet – I knew I should have hired a mobility scooter! By the time I got back to the cabin Robert, my cabin steward, had already been in and made it up, he will get used to my early mornings. I decided to have breakfast in the main dining room. Have to say it was very enjoyable. Lovely hot plate of bacon, sausage, eggs and baked beans. 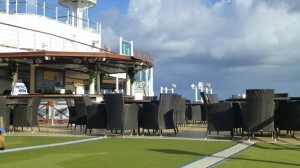 Sat on a nice table for 8, 4 of us had just arrived and four were just disembarking. They were not impressed to us telling them how cold it was at home. I was very late leaving the ship, well late for me. 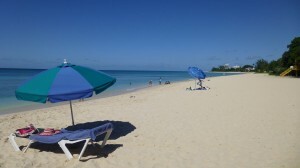 I fancied going to Mullins Beach but the taxi man wanted 30 USD each way, all because it was Independence Day! He came down a little and I agreed, but when he failed to attract anyone else wanting to go there I decided against it. I needed to know there was someone else I could get in a cab with on the way back. No way was I getting in a taxi alone! Another couple were going to Brandons Beach. I had a rough idea where it was so I decided to go there for a change. It was in a lovely bay, and it was the locals beach. I had a lovely sunlounger and brollie right on the waters edge, the other couple stayed close by, so it was just us and all the locals out celebrating Independence Day, mainly families which was nice. Another thing that was nice was there were no water sports, no hawkers on the beach trying to sell us anything and everything. We were just left alone. The sunlounger man kept me supplied with rum punches. The water was oh so inviting, extremely calm and clear. And the sun was intense. I believe we hit 30 degs. I spent my time in and out of the sea to keep cool and must have used close to a bottle of sun lotion. I need to get more supplies. My new friends informed me when they were going back to the ship so I hitched a ride back with them. The sunlounger man said he would get us a taxi when we were ready. The ‘taxi’ turned out to be his high as a kite mate. What the heck was I doing letting him take us back, but then where do you call a cab from? I got a bit paranoid when he turned left instead of right out of the beach until the others pointed out it had a central reservation and was one way. Somehow he got us back safely but I was glad to get out of his car. The stroll back to the terminal from the port gates seemed a long one in the heat, with my poorly feet, so I sat down once in the terminal and hooked up to the free wifi . There was a right old party going on at the bar by the e to the terminal with dancers and very loud reggae music. I had to cool off with a smoothie, which Mr C found highly amusing that I was drinking smoothies to cool down whilst he was so cold back at home. I arrived back at security just as a plane load or three were checking in. They really dont like it when single passengers appear from nowhere and nip in the queue as directe. Jeeze they had got off a plane and they were coming through! I even got jostled out of the way by one passenger because he thought I was going up the gangway before him, well I have my own gangway thank you very much! Back onboard I was in need of a little snackette, so opted for a couple of finger sandwiches from the buffet and collected some cans of sprite and tango on the way back to the cabin. It was scorching on the balcony so I sat out there for half an hour before having a shower, being nice to my feet by applying some soothing foot cream and then propping them up on a stack of pillows to try and get the swelling down. They are not happy feet today! 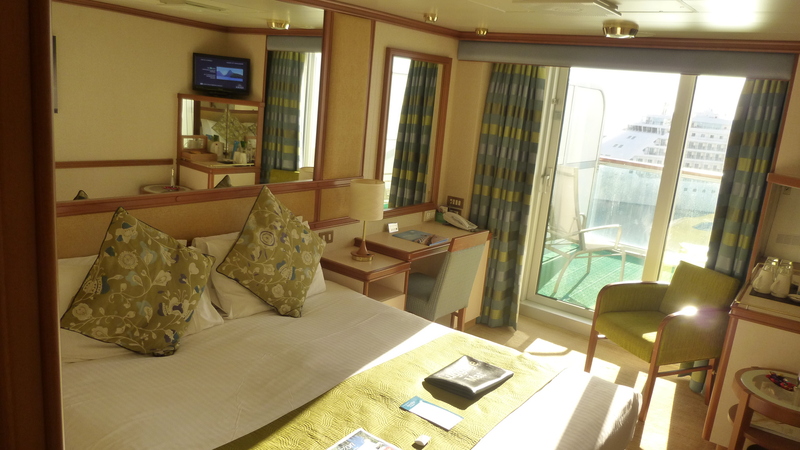 I had a little snooze, watched the sunset at 28 mins past 5, watched Seabourn go out, and then had a little bit more shut eye, because I can. Barbeque on deck this evening or should I go to the restaurant and see who sits at table 98? Will table 98 decide to turn up or go to the barbeque? 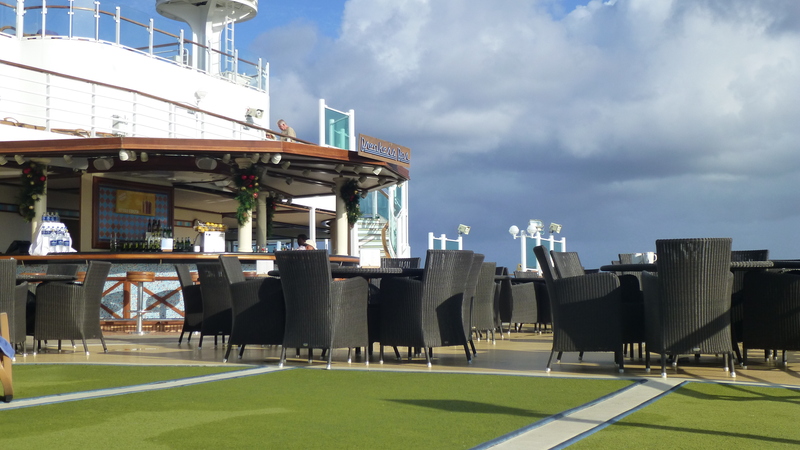 There are lots of decisions this cruise. It was muster drill at 8.00pm so no time for pre dinner drinks. I waited for the shops to open because I needed some perfume, or at least a spray of some, but the perfume shop was not open this evening, there is however a ‘big unveiling’ tomorrow for which I have a raffle ticket. Oooh a ‘big unveiling’ how novel! Wonder how many there will be this cruise. I decided against the barbeque. 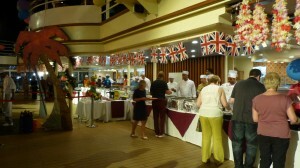 I’m never a fan, and I don’t do queuing for food, especially on holiday – that’s what Mr C is for (love you Mr C!) I also consider it a bit of a health risk not knowing where the person in fronts hands have been prior to touching the tongues. I decided to go and investigate table 98. As I was walking through Malabar, en route to the restaurant, a voice shouted Hello. It was my flight friend. I became a version of his inflight wife on the plane. He sat across the isle from my invisible friend next to me and struggled to find his tv monitor and table etc so I was like his inflight wife sorting him out. He even had me ordering his drinks for him and was in competition with me at one point to see who could get the most drinks. I would like to point out that I’m not greedy, I didn’t keep asking for drinks on the flight, its just that the flight attendant kept putting them down on my table. Anyway, back to Malabar. The voice shouting Hello was Garry from the flight. He was sat at the bar having a pint to pluck up courage whether to go to dinner or not. He was worried what his fellow dining companions would be like. What table was he at? Table 98, yes! How exciting we plotted to go in as a married couple. My plan was floored at the door. The usual line up of waiters stood at the door insisting to see your table card. Thats Mr C’s job to remember to bring that along and as he’s not with me, so I had to explain I had left it behind. ‘Well, in that case you will have to see the restaurant Manager’ Oooh Ive been told off before dinner! The Restaurant manager greeted me with a smile, “Good evening Mrs Chadwick, you are on table 98” lol, I knew that and my new friend Garry was pretty impressed that the restaurant manager knew that also without any prompting. Did he have some form of automatic retina ID, lol. I then had to explain that this random man, who’s name I didn’t know at the time was also on table 98 with me. It all got very confusing especially when I had to explain that Mr C was alive and well and all was not as it seemed. I wasn’t walking around picking up random men. As we walked into the restaurant every other waiter seemed to recognise me, poor Garry was mega confused by now. Table 98 is right in the back corner. Two people were already sat, a lady called Kathy and a man by the name of Brian. They presumed we were to be a table of single travelling alone passengers, but Garry blew that theory out of the window by announcing we had been together for 5 years. Oh dear it’s going to get very confusing. I’m confused and don’t know what’s going on myself! Only the four of us had turned up, so either the other 4 had been in and observed us from a distance and decided not to bother, or they had gone to the barbeque. Much hilarity ensued throughout dinner, mostly caused by the fact that Brian was deaf and wore and hearing aid in both ears. He was having difficulty picking up conversation so mixed it in with a bit of lip reading. He did however choose to give the wine waiter a hard time, of which I did not approve as it was totally unnecessary. We were very late leaving the restaurant and I was going to go to Planet Bar but the others fancied somewhere lively, so we ended up in Manhattan. Which was fine whilst Jet Set were on but then the comedian came on. Unfortunately Brain doesn’t realise how loud he talks, being deaf, and seemed to want to talk through most of his act. The comedian wasn’t that funny anyway. I retreated to my bed just after midnight mainly dictated by my feet, which had now swollen to epic proportions and were very painful. Time to get them elevated on a stack of pillows. I stepped out on the balcony and the starts were oh so bright, and seemed close enough to touch. Goodnight. I was awake with a very throbbing foot at 5.00am, oh dear I think they are going to cause me problems this cruise. I watched the sun rise and did a bit of writing and checking of emails whilst the internet was quiet so more efficient. 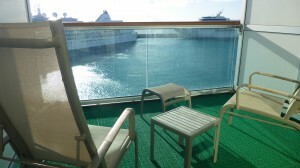 After watching the sunrise I went out on deck to claim my sunlounger by Breakers Bar just after 7.00am. Heck it was hot. To be fair there wasn’t much evidence of sunbed reserving and didn’t seem to be most of the morning. Maybe there is a different breed of passenger this cruise. For breakfast I went down to deck 5 and collected a Costa vanilla latte and a blueberry muffin, which was more than enough for me. The heat on deck became too much for me, it was absolutely intense and I welcomed the short rain shower that came along and cooled me off. It was soon back to full on heat though. I stuck it out until 11.00am and then called it a day. Time for a shower and a long cool dress. I had a bit of a mooch about, went to the shops, then observed who was doing what where and then decided on lunch in Peninsular restaurant. A quite table for one by the window, glass of chilled white wine and a simple chilli con carne for lunch. I was tired, I could hear my bed calling, and so that was my afternoon sorted. I got up a few hours later and nipped to the shop to purchase some perfume, I was given a raffle ticket which was being drawn 5 mins later, so I hung around. I won! So now I have two bottles of perfume! I’m impressed with my prize of a bottle of Swarovski perfume though. Captains Gala night this evening and I met Cruise Director Neil in Glass House for pre party drinks and chat. We had a lot to catch up on, been a while since July lol. He then escorted me to the party, made sure I had a drink. Captain Paul was fashionably late, but he had only just arrived, said hello to me, done the kissy bit and whilst in full flow conversation a couple came up and just butted in. Apparently they thought that was acceptable based on the fact they were ‘fellow Yorkshiremen’ Well I call it dam rude and how the officers put up with it is beyond me. No wonder not many of them come out on decks often. If they were so desperate for a conversation with some stripes then dam well wait in line! Dinner this evening in Oriental on the ‘singles table’ we had one more join us this evening, Chris, he had been to the barbeque last night. The other three seats remain empty and I wonder if they will ever be filled now. This silver service lark makes me smile, I had the beef which was already more or less a plated meal of meat, new pots, veg and Yorkshire pudding so why would I want some sloppy creamy potatoes and cheesy cauliflower slapped ontop of it. The poor wine waiter had hassles with one of my table companions, thats two nights in a row this fella has unnecessarily given the wine waiter a hard time so I had to intervene and once more stick up for the wine waiter. By the end of the meal I needed to escape and get out of there despite the others trying to arrange where to go etc. I need space so I retreated to Planet Bar and sat at the bar, enjoying a nice salt rimmed margarita. It was lovely and cool so it was nice to just sit and be quite. I would have quite happily gone to bed after that, but as I wandered along deck 7 I bumped into Garry, fellow table companion and we originally met on the flight. He invited me for a drink at Malabar Bar, so I decided to be sociable and join him for one. Changez were on and it was very lively in there this evening. When they finished for the night, I was happy to go to my bed, my feet needed to be elevated, but somehow Garry persuaded me to go Manhattan with him. Simply Red look alike was on, and he was excellent. I hadn’t seen his act before. I would have guessed that he wore a wig but he came over to speak to us after and it was no wig. Red curly hair is a bonus if you want to be a Simply Red look alike! We met up with Chris from dinner. The nightclub was lively, very lively. We had such a laugh, I don’t really know what about but at one point I was crying with laughter and was worried my makeup was sliding down my face. Before I knew it, it was 3.00am, lol, I think I’m a bad influence on Garry because he staggered out of there. I do hope he found his way home ok!